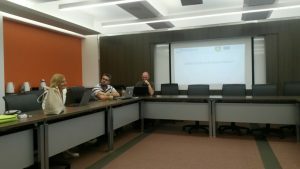 CERIDES and ICTEE organised the sustainability & exploitability workshop for Serbian participants of the NeReLa project from September 26 – September 29, 2016 at School of Sciences in Nicosia. The workshop was devoted to presentations of current state of the project, demonstration of remote experiments from LiReX library to students from School of Sciences as well as discussion on sustainable usage of LiReX resources and complementing and sharing LiReX resources at international level after the end of the project. The Dean of the School of Sciences, and Assistant Director of CERIDES and ICTEE, Dr. Christos Dimopoulos European University Cyprus and Dean of Faculty of Technical Science Čačak, University of Kragujevac have drafted the agreement on academic linkage and collaboration between their institutions. The ICT-Enhanced Education Laboratory participates in the implementation of the JOBIT project (Innovative teaching methodologies and courseware for software development Vocational Education and Training (VET) to reduce skills gap in IT) which is funded through the Horizon 2020 ERASMUS+ Program.